The bad joke, riddle, or pun. It’s expected, looked forward to, and as a result it fills the night with many groans, guffaws, and much head shaking at awful punchlines. Still, it’s a tradition that is ours. Yes, there’s no just calling out “trick-or-treat” here. Anyone old enough to ring the doorbell is old enough to entertain candy-givers with at least an attempt at humor. To make sure that you and your family are ready to go this year, here are a few of our favorite joke books that can provide you with your last-minute chuckle. Don’t forget to test your joke at your favorite Branch of the St. Louis Public Library! 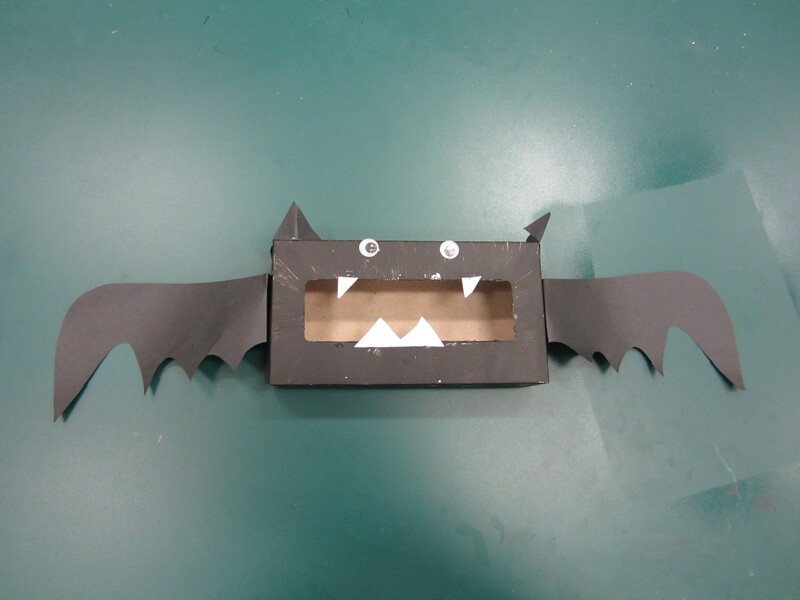 Make two great crafts: Monster Puppets and Spider Web Plates on Wednesday afternoon while supplies last! 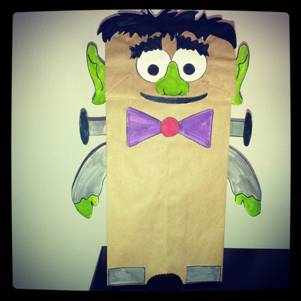 Here’s a great Friday craft for all of you out there in cyberspace: make a MonsterBox to keep your Halloween treats safe this year. No Parents, pets, or siblings would dare to challenge such a terrifying guardian of sweets so you may rest easy knowing that your haul is well protected. 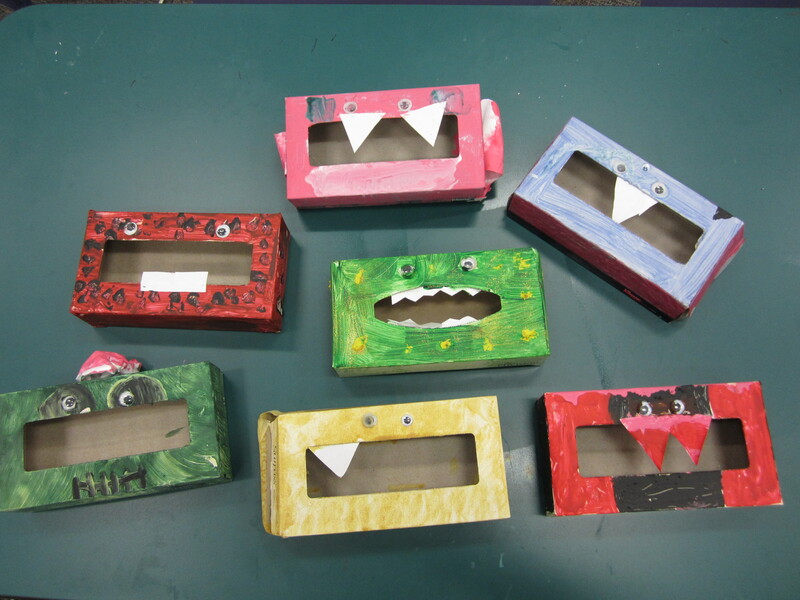 The photos in this post are examples of MonsterBoxes made by youth patrons at the Baden Branch of the St. Louis Public Library. With that news, we thought we would give you a monster of a blogpost: a collection of our favorite books–some scary, some not so much, and some downright funny. All of them are great for entertaining others on an eerie autumn evening… Drop into your favorite St. Louis Public Library Branch and take a few home today! A hilarious, rhythmic parody starring a scientist who sleeps on a gurney and a castle full of headless monsters. What happens when the big, strong man stays a night in a big, spooky house? Find out in this great picture book, perfect for read aloud storytimes. What could be the the most fearsome creature in the forest–the big, bad Gruffalo or a tiny mouse? Try this picture book for great adjectives and learning to use your wits to steer clear of trouble. Lots to do this week at the St. Louis Public Library; whether you want storytimes, fall crafts, or Halloween goodies be sure to visit! Have a great week & we hope to have you join us! A Web You May Not Want to Surf! Confined to a U.S. internment camp during the Second World War, one family works to unite one another, and the camp as a whole, through baseball. A Great introduction to all parts of the game–from the history of the sport to the official allowable weights of a Major League ball. This book is full of facts, figures, and photographs for the novice or an old pro.